The Semovente Ruotato da 90/52 Breda 501 (shortened as Breda 501) is a Rank III Italian tank destroyer with a battle rating of 4.0 (AB/RB/SB). It was introduced in Update 1.85 "Supersonic". The Breda 501 represents a large and poorly-armoured target for any enemy vehicle. The crew members, barring the driver, are extremely exposed to machine gun fire and players will regularly find themselves being strafed into oblivion by aircraft. The vehicles' internal modules are spread throughout, with the engine and ammo racks being placed high up at the rear behind only 8mm of armour. This makes it possible for the Breda to be immobilised entirely by machine-gun fire. As well as this, the Bredas' gun breech is totally exposed and rises above even the minimal side armour, making it incredibly easy to knock out from the sides. The thickest armour on the vehicle is the 30mm gun shield and frontal plate. This protects from heavy machine guns, but does little to stop any kind of tank shell, making the Breda easy to penetrate even for lower-rank SPAA. As a wheeled vehicle the Breda 501 struggles on any kind of soft ground such as snow, sand and wet mud. It also cannot turn on the spot as a tracked vehicle can, making turning the vehicle around in a confined space extremely time-consuming when combined with its very slow reverse speed. The Breda 501 boasts a very effective high-velocity gun for its rank, offering high penetration and excellent post-penetration damage. This combines well with the vehicles' high top speed and allows players to quickly get into strong flanking positions early in the game. 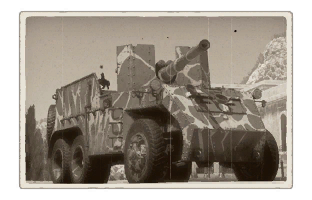 The Breda can heavily punish enemy vehicles from a variety of ranges in these positions. The Breda can also be used in a more aggressive role on some urban maps. 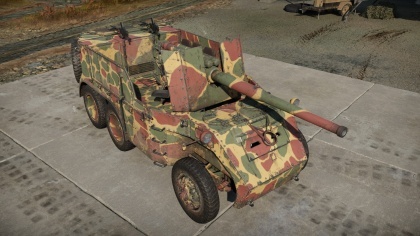 The 90mm gun has an excellent horizontal traverse range, meaning players can get their gun sighted round corners without fully exposing the vehicle. With a high top speed, the Breda can knock out enemy tanks before quickly disengaging, although players must beware of the slow reverse speed when planning an ambush. The Breda can encounter BR 4.7 heavy tanks such as the Sherman Jumbo, whose thick, angled frontal armour presents a significant challenge. If possible the Breda should look to flank the Jumbo, where its gun can easily obliterate the US tank from the side. If forced to engage an angled Jumbo from the front, the Shermans' machine gun port represents a small weakspot. Aside from this, shots into the turret ring can penetrate the Jumbo, but this may not be reliable. Skin and Camouflages for the Breda 501 in Warthunder Live. [Forum] Official Forum Thread for Breda 501. This page was last edited on 5 April 2019, at 00:59.